This week there are just four Big Brother Naija 2018 housemates up for possible eviction from the house. 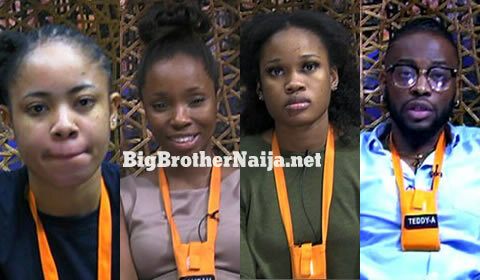 Following today’s live nominations, there are four housemates who received the highest number of nominations. Cee-C received 6 nominations, Teddy A and Bambam received 4 nominations each while Nina received 3 nominations. Big Brother then announced the above four mentioned housemates as the ones up for possible eviction from the house this week.